Drug runners may be targeting Nigerian women as "mules" after a UK government clampdown in Jamaica, warn campaigners. The number of Nigerian women on drugs charges in UK jails has risen almost sixfold in three years, figures supplied to the BBC News website show. On 30 June this year, 85 of the 151 Nigerian women in custody in the UK were being held for drugs offences. In 2002 there were just 15 out of 29. The Home Office data also shows a rise among women from Trinidad and Tobago. The BBC News website is exploring drugs in Britain in a special series of features which starts today. We will look at how drugs get here, who uses them and whether current anti-drugs strategies are working. "Guys who organise these people always try to stay one step ahead of the people who are deterring them so they will look and see what is going on and move accordingly." HM Revenue and Customs said the number of Jamaicans trying to smuggle drugs to the UK by swallowing them had reduced by over 90% thanks to Operation Airbridge. 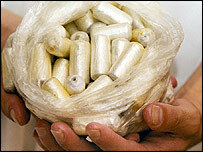 "We remain vigilant as the drugs organisers look for new ways to get round our operations," a spokeswoman said. She added that Customs could not prove a link between the decline in Jamaica and the rise in Nigeria, but the successful operation in Jamaica had freed up resources to tackle the problem in "other risk areas such as west Africa". Hibiscus is looking into doing educational work in Nigeria in 2006 and the charity is about to launch in Trinidad the same campaign it has been running in Jamaica. 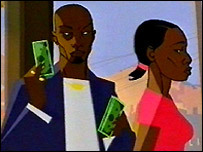 Its centrepiece is a three-minute TV animation showing the cautionary tale of Eva - a Jamaican woman with young children who is duped and bribed into carrying drugs and then gets caught on arrival in Britain. Unlike the teenage lead character in Maria Full of Grace, the recent film about drugs mules, the women who Olga Heaven sees tend to be single mothers in their 30s with several children depending on them. "Women with children get caught up in a situation where they begin to borrow money for schooling, or for paying rent, and they are not employable because of lack of training. "They don't have another way out of their situation, carrying drugs is their last resort." Denise Iwenofu*, a 31-year-old mother of two from Lagos, admits that she smuggled drugs for financial gain but says she did not realise at first what she was getting into. "I don't want my children to be like me because I didn't go to school and in my country if you don't go to school it is not easy to get a job," she said. "[Some men] said to me they would give me £2,000 to send my kids to school. They said I would be sponsored to London and I would get a job there and send the money back." But when she followed up the offer, she was taken to a hotel and told she would be paid according to how many cocaine packages she swallowed. The man said that when she arrived in London she would be met by another man who would give her a laxative, retrieve the drugs and pay her. "He said if I tell anybody I would be killed. I had to do a vow to him that I would not tell anybody," she said. Caught on arrival into the country, Denise was sentenced to six years of which she has served 16 months so far. Hers is an average sentence but mules can receive up to 14 years for amounts under 5kg. Alice Ukoko, director of campaign group Women of Nigeria International warns there will be more and more women like Denise in British jails if poverty in Nigeria remains unaddressed. "All this is happening because there is a low level of awareness, economic hardship and hopelessness on the ground," she said. "Nigerians have reached a situation where we don't know what law and order means. You just do things that you think will bring you money, whether it's in the law or not. She added: "England is like heaven so people want to come to England. When you tell them people are suffering over here they say 'How can it be? Nigeria is the place where people suffer.'" *Names of the prisoners have been changed for this article.